Yes, we do favor the Indiana Hoosiers as far as coverage goes, but why not keep tabs on the rest of the B1G conference throughout the season. Stay tuned every Tuesday morning for an updated look at both the standings and the team breakdown for each program. 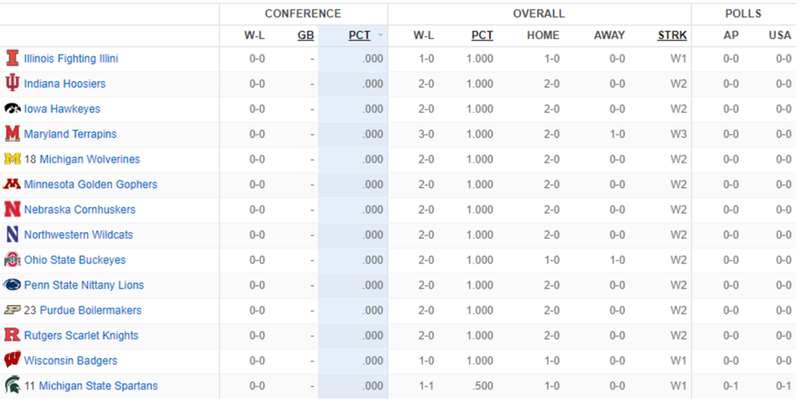 Feel free to click here to check out the standings page on ESPN.com now. Ben’s Thoughts: Indiana’s season on the court couldn’t start out much better than it did as far as straight taking care of business. Sure, there were areas to work on (perimeter shooting and free throws) and the Hoosiers have been battling nagging injuries to key players, but so far so good. The first true test comes Wednesday night (11/14) as #24 Marquette makes their way to Bloomington. Are they ready for the challenge? How significant of a role will the fan base play as far as atmospheric sixth man goes? We will soon find out. Ben’s Thoughts: Not much to be known here in the early start of the season for the Fighting Illini. They disposed of the Evansville Aces in a 39-point thrashing with five Illini players finishing in double figures led by Aaron Jordan (19 points, 7 rebounds) and Ayo Dosunmu (18 points, 6 rebounds, and 4 assists). They will face a tougher challenge tonight against Georgetown (2-0) as part of the Gavitt Tipoff Games. You can catch it on Fox Sports 1 around 8:30 pm EST. Ben’s Thoughts: The Hawkeyes are off to a solid start after victories over UMKC and Green Bay. They have been led by Tyler Cook (14.5 ppg; 62% FG). Three other Iowa players are averaging double figures as well. Right at 12.5 ppg for Jordan Bohannon, Joe Wieskamp, and Luka Garza. Competition ramps up come Thursday night (11/15) against #13 Oregon (2-0) in the 2K Empire Classic held in New York. You can catch the game LIVE on ESPN 2 around 8:15 pm EST. Ben’s Thoughts: In my opinion, the Terps have an easy start to the season. They have a very good chance to be 6-0 before they face their first tough test of the season come November 28th vs. #4 Virginia in the ACC/B1G Challenge. Next on the agenda for them is Hofstra (11/16), Mount St. Mary’s (11/18), and Marshall (11/23) before facing the Cavaliers. Either way, I feel that is setting up to be an interesting matchup come the 28th. 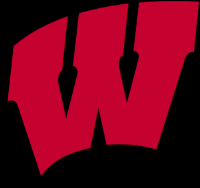 Ben’s Thoughts: The Wolverines are favored to be one of the better teams within the B1G conference this season. So far, they are not exactly lighting the scoreboard up, but they are taking care of the teams that they are suppose to. More impressively, holding both opponents below 50 points including only allowing Holy Cross to score 37. The road ahead is gets interesting very quickly as they head to #8 Villanova come tomorrow night (11/14) as part of the Gavitt Tipoff Games. You can catch that on Fox Sports 1 around 6:30 pm EST. Ben’s Thoughts: The Golden Gophers picked up a nice W over a Utah team that (I felt) was a real toss-up kind of contest. Minnesota had five players finish in double-figures led by Jordan Murphy’s 11-point 17-rebound performance. Gabe Kalscheur led the Gophers in scoring with 19 points. They will have some much needed rest ahead of them before their next game come Sunday night (11/18) against Texas A&M (1-1) in the Vancouver Showcase. Ben’s Thoughts: Even though they have played lesser competition, holding your opponents to 37 or less and scoring 85+ is pretty damn good. 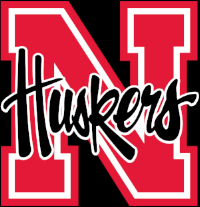 Glynn Watson Jr. (17.5 ppg; 70% FG) and James Palmer Jr. (17.0 ppg) head the Cornhuskers attack early on. They will get their first tough test come Wednesday night (11/14) against Seton Hall (1-0) in the Gavitt Tipoff Games. The game will be televised on Big Ten Network around 7:30 pm EST. Ben’s Thoughts: The Boilermakers kicked off their season in fair fashion so far in defeating both Fairfield and Ball State. The Cardinals managed to out up more of a fight in the Saturday contest but fell short. Carson Edwards (26.5 ppg; 3.5 apg) leads them as three others currently average double figures - Matt Haarms (12.5), Evan Boudreaux (12.0), and Ryan Cline (11.0). Next up, the Charleston Classic vs. Appalachian State November 15th (Thursday night). You can catch the game on ESPN 2 around 5 pm. Ben’s Thoughts: Vic Law (22.0 ppg; 6.0 rpg) leads a Northwestern squad that is off to a nice start to their season. The Wildcats have favorable schedule leading up to their first B1G game of the season vs. Indiana December 1. Binghamton (11/16) awaits them next, followed by Fresno State (11/22), La Salle (11/23), and then Georgia Tech (11/28) in the ACC/B1G Challenge. Ben’s Thoughts: The Buckeyes pulled out a squeaker before ruffing up the Mastodons of Fort Wayne. Their next challenge will be this coming Thursday night (11/15) vs. Creighton. OSU is led in scoring by CJ Jackson (19.0) and Jaedon LeDee (16.0). Kaleb Wesson (11.5 ppg, 7.0 rpg) is another player of note to keep an eye on this season. Ben’s Thoughts: For a team projected to finish at the bottom of the B1G this season, it is imperative the Scarlet Knights win out as many non-conference games as possible. So far so good. Competition will get tougher come Friday night (11/16) as they face St. Johns in the Gavitt Tipoff Games. You can catch the game on Big Ten Network around 7 pm. Ben’s Thoughts: The Badgers will return to the court tonight vs. Xavier in the Gavitt Tipoff Games. You can catch the game on Fox Sports 1 around 6:30 EST. Ben’s Thoughts: The Nittany Lions will head off to Chicago to face DePaul Thursday night (11/15) in the Gavitt Tipoff Games in what will be their first tougher test of the young season. PSU is led by Lamar Stevens (23.5 ppg; 9.5 rpg). Ben’s Thoughts: The Spartans started off the season with a tougher road than any team in Division I as they faced off with then-No. 1 Kansas. The Jayhawks would go onto win that game and the Spartans would move on to Sunday and defeat Florida Gulf Coast. Although, the season is young, giving up over 80+ points will not cut it for long for MSU. They have a couple of more tune-up games (Louisiana Monroe and Tennessee Tech) coming up before they face UCLA in the Las Vegas Invitational November 22nd. Stay tuned throughout the year as we provide weekly updates for you on the state of the B1G conference.